Paper upload opens FRIDAY, MARCH 30, 2018. Paper submission: JACoW Scientific Program Management System (SPMS). A PDF file made from this document. If you do not have the ability to generate a PDF file, submit a PostScript file made from the source. PDF, PowerPoint or OpenOffice/LibreOffice of slides are used for the oral presentation (and associated video or animation files where appropriate in their native format). Note that PDF files produced according to the JACoW recipe will resolve the problems listed above. 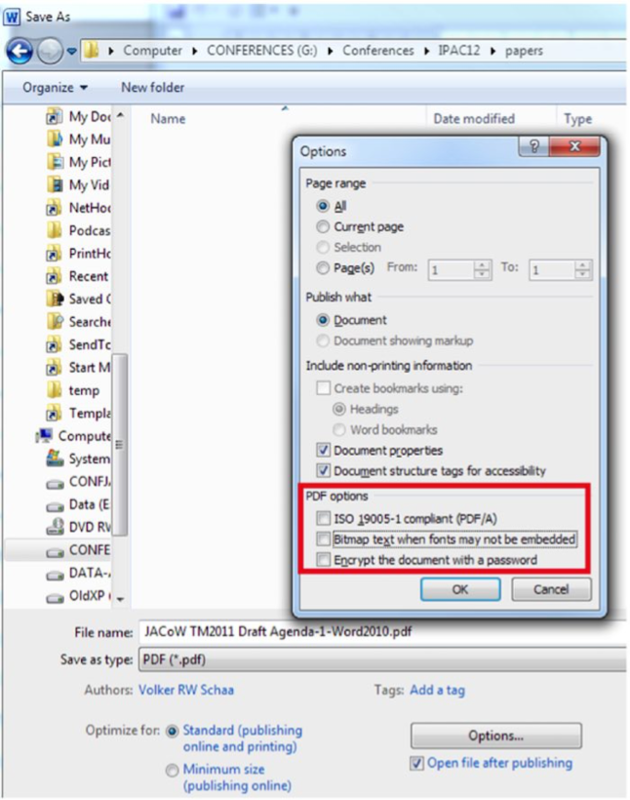 We have prepared a workflow that enables us to process and convert author PDF files to JACoW acceptable ones. What Files Should Be Provided? How Do You Produce a JACoW Acceptable PDF File? There is a second set of parameters that should be set (accessible via “Tools → Save Options…”). This influences the font embedding in the source file. This eases the work for the editors when problems with unrecognized symbols occur with PS/PDF files and the source file has to be used. The set of JACoW templates ensures a unique formatting on paper formats used in countries with US letter and A4 sized paper. Pre-2010 versions of Microsoft Word do not have the capability to “Save As” a PDF file. It is common to use a virtual printer driver that creates an electronic PDF file, rather than printing to an actual printer. There are several similar tools available, both for free or purchased. We do not suggest any particular one. Please check that such PDFs do satisfy the JACoW formatting requirements and that the overall quality of the generated file is satisfactory to the authors. Remember to always check that the file prints correctly. Note that Word 2011 on Mac does not embed fonts properly in the output PDF when OpenType extensions are used, resulting in extremely large PDF output. OpenType extensions should be disabled under Preferences / Compatibility / Disable OpenType Font Formatting Features; this is done for you if you use the JACoW Mac templates. Please check the size of your PDF before uploading to the IPAC'18 SPMS - it should be less than 1.5 Mb. You can generate your PDF file using the “Export as PDF” function of OpenOffice Writer accessible via the “File” option (below, left). Before clicking the “Export” button make sure that the PDF options for “Images” and “General” are set as shown below (right). Ensure that the paper title and co-authors on the paper are identical to the paper title and co-authors entered into the SPMS. If this is not the case, click on the links “edit” or “authors” and update. SPMS data will be used for the production of the table of contents and author index of the proceedings. Failure to enter all co-authors means they will be omitted from the author index. Click on the file Upload link. Be aware that large files may take some time to transfer. Papers will undergo processing by the technical editors directly following deadline for submission, Wednesday, April 25, 2018, and authors will be able to check the status of their paper(s) by logging into their IPAC Author Account, or checking the dot board. Email notifications of the processing status will also be triggered to primary (submitting) authors as processing is completed.